Early in 1939 the Army requested that the existing track to the Head be widened into a road capable of carrying heavy traffic.The work was carried out by the Ministry of Works and completed by the end of the year. 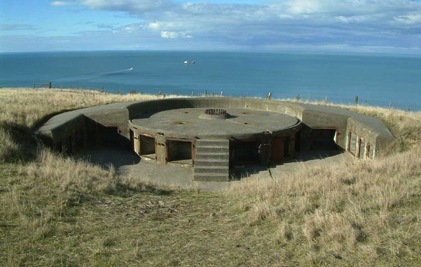 In July 1939 the New Zealand Government approved provisional cost estimates for the Godley Battery but when war was declared against Germany in September of that year, little work had been done except the upgrading of the road and a 120m access tunnel for the searchlights which was completed by August 1939. 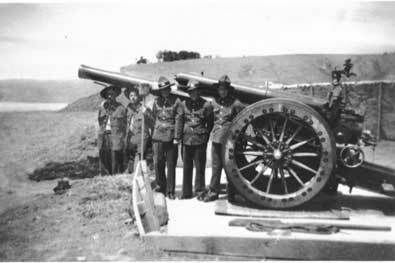 Six days after the outbreak of war (9th of September 1939), thirty gunners with two carriage mounted Mk.III 60 pounder World War One field guns arrived at Godley Head from Trentham Camp, near Wellington. They immediately set up the guns several hundred metres north of the intended main Battery position. The gunners initially cooked in trenches and ate in the open. At times the wind was so strong it literally blew the food from their plates. At first they had to erect tents to live in as the area was devoid of buildings except for the lighthouse and keepers cottage. By mid 1940 proper barracks were being built at GH. The gunners moved in to them as they were completed. The 60 pounder Battery was provided with a Barr and Stroud range finder mounted immediately behind the gun positions. Although designated “to prevent hostile vessels bombarding from anchor in the vicinity of the harbour entrance and generally to act as far as possible in the counter bombardment role” they were only a stop-gap provision. The concrete pads from which the guns were fired are still visible and were recently restored by the Godley Trust. When the Royal New Zealand Navy decided not to equip a second armed merchant cruiser it made two of its intended weapons available to the Army for Godley Head provided they were mounted in areas the Navy considered appropriate for defence. Work soon began on these more effective installations, behind and to the sides of the existing 60 pounder sites. This Battery was to be armed with breach loading 6 inch Mk VII guns on PIII pivot mountings in reinforced concrete barbette positions. The guns and mountings registrations were 1951 on P1108 and 1525 on P805. These two weapons, collectively known as the Taylor Battery, were intended to tide the port defences over till the main Godley Battery was completed on the lighthouse site. Moving the two six inch guns from the Port of Lyttelton to the Battery site was beyond the vehicular capacity of local Army resources. The Royal New Zealand Air Force Station at Wigram was called on for a loan of their specialised aircraft-moving vehicle, to transport the gun barrels. The Taylor Battery was operational by July of 1941. Because it was only intended as a temporary Battery, Taylor had neither engine room nor magazine. Ready use lockers were embedded in the rear of each gun platform, reserve ammunition and cartridges were stored under canvas nearby. A basic Battery Observation Post (BOP) was set up between and to the rear of the two 6 inch guns. The initial firing of the Taylor Battery had an unexpected reaction from the Port War Signal Station. The concussion from the guns' muzzle blast shattered the station’s fibro-cement sheathing, forcing the Navy to move the station further up the hill towards the Godley Head Battery site and out of harms way. 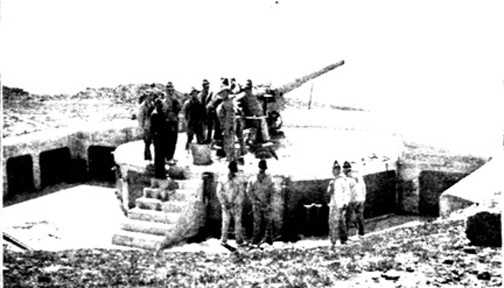 Taylor Battery remained operational for a little over six months before the first of the Godley Battery guns came into service. The Taylor guns were then dismounted and and were reported to have gone to the Bay of Islands. Some time after the site was abandoned the Army made an unsuccessful attempt to blow up the northern most gun platform. The last of the buildings from the battery were removed in 1984. 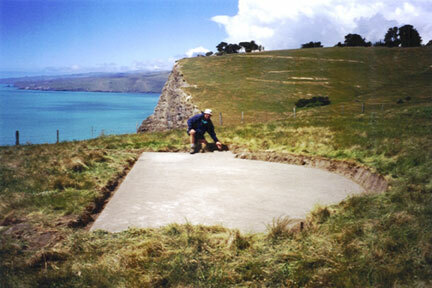 The Taylor Battery emplacements were recently cleaned up by the Godley Head Heritage Trust. A considerable amount of repair and preservation work is still to be done there. Taylor Battery site after cleaning. The rapid advancement of the Japanese forces in early 1942 placed New Zealand under direct threat of invasion. A large number of anti-invasion defences were thrown up around the country. The battery complex at Godley Head was considered potentially vulnerable to a raiding party or a proper invasion. The assumption was that the destruction of the battery would allow a direct attack on or seizure of the port of Lyttelton. To counter this threat the peninsula of land East from St Andrew’s Hill / Lyttelton Port Valley to Godley Head was declared a Fortress Area and placed under martial law. A comprehensive system of infantry and anti-tank defences were constructed throughout the Fortress Area. Locally prefabricated concrete pill-boxes were extensively used, of which a number are still visible today. During the height of the invasion scare following Japan’s entry into the war there were a total of 158 officers and 2,893 men stationed within the Lyttelton Fortress. These were made up of artillery personnel manning the battery and infantry supporting them. Included were ancillary forces such as ambulance corps. These numbers did not include the Home Guard units based in the surrounding towns and countryside. As the threat of invasion receded with the War in the Pacific retreating towards Japan, most coast defence installations in New Zealand were stood down from active service. Godley Head was put in to care and maintenance in early November 1943. Care and maintenance meant that only the observation posts were continually manned, however, in the event of an alarm being raised, the guns could be brought into action within ten minutes. Prior to this the guns had been manned continuously from one hour before to one hour after both dawn and dusk, as this was considered the most likely moment of attack. All WAAC (Women’s Auxiliary Army Corp) personnel were transferred to Burnham Military Camp in April 1945. The battery was now placed in reserve, with all equipment sealed up. The only exception to this was the PWSS (Port War Signal Station) radar which operated until 1946 as an aid to the inter-island ferry service. The only work done in this period of inactivity was, surprisingly enough, the installation of the third gun and shield, which had lain disassembled by the side of its pit from 1943. Godley Head never saw active service. However, it came within a hair's breadth in June 1941. A captured Norwegian whale chase boat, renamed Adjutant, acted as an auxiliary for the German armed merchant raider Komet. The Adjutant was used to lay a pattern of ten magnetic mines between three and ten kilometres off Adderly and Godley Heads. A vessel was believed to have been sighted by those manning the night OP at Godley Head, but the report was apparently dismissed by the duty officer. The mine laying wasn’t revealed until the log of the Komet was examined after the fall of Nazi Germany. The mines have never been found, nor has a similar field reputed to have been laid by the same vessel off Wellington. Amongst the theories explaining the failure of the mines, was that the batteries powering the mines had been allowed to go flat while they were still on the Adjutant. A different theory was that the mines were dropped in water too deep to allow the mechanism to properly operate. Recently, the option that the mines were never dropped at all has been put forward, since the only record was the Komet’s log book. However, the Naval and Coastal Defences of Wellington did hunt for a vessel acting suspiciously off the Wellington Harbour entrance, which was presumed to have been the Adjutant. Despite the lack of active service, the guns, nevertheless, served their purpose. Like many service personnel, they also only stood and waited. Four German commerce or merchant raiders, the Orion, Komet, Pinguin and Atlantis, plus the accompanying Adjutant, sank a total of fourteen ships and mined a further five in the Australasian region within the first two years of the war. German and Japanese submarines scouted the coasts for the remainder of WW2. Had it not been for the defensive spines of Godley Head and other coastal defence batteries, we would certainly have endured much closer and more painful attention from these passing enemy vessels.